ePhotoZine, DPReview, and IanTan.org has reviewed the new Olympus XZ-1, shown in prototype form at Photokina. The camera features a high sensitivity 10 megapixel CCD sensor, an i.Zuiko Digital f1.8-f2.5 wide angle 4x optical zoom lens (28-112mm), with lens ring and another dial at the back, the camera also features a high resolution 3″ 631k pixel OLED screen, manual controls, RAW support, ISO100-6400, built in flash, flash hot-shoe, accessory port (as featured in the PEN series), multi-exposure, AF illuminator, 1cm macro, art filters, HDMI out, 320 shot battery life, lithium ion batter, upto 7/15fps shooting (JPEG, 2fps RAW), 720p HD video (at 30fps), and will be available in white or black. 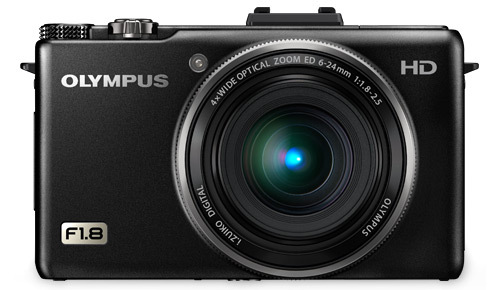 The Olympus XZ-1 is available from Amazon UK in black or white for £399.